Studying vehicles and transportation is an engaging topic for most preschool children. Preschool teachers often weave the transportation theme into the school year. Having great books about transportation can really help children as they dive into a vehicle study. As a mom of two preschoolers, we play with trucks, cars, buses, and boats nearly every day. 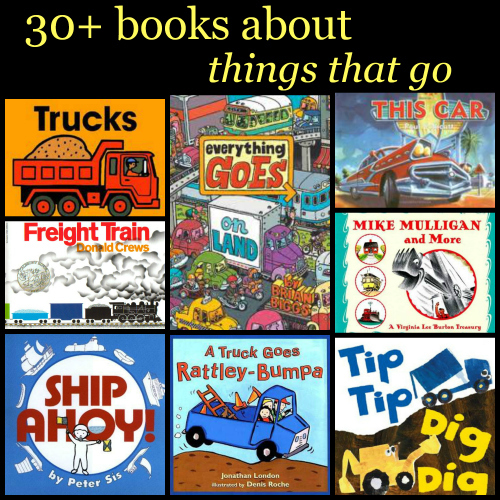 We have many favorite books about "things that go". I've been compiling book lists for preschool themes. This helps me to quickly gather up the titles I need for each thematic unit. I have book lists for back to school ideas, shapes, colors, me and my family, under the sea, animals, gardens, dinosaurs, community helpers, and friendship. Here are a few of our favorite books about transportation. Everything Goes in the Air by Brian Biggs are a wonderful transportation books to add to your collection. (The links in this post are Amazon affiliate links. Clicking on the picture of the book title will take you to the book on Amazon for your convenience). In Everything Goes: On Land by Brian Biggs, children will travel with Henry and his dad through the busy city. On each page, there are labels, street signs, and dialogue to be read. Occasionally the books cuts away from the busy seek and find type pages to reveal a large image of a vehicle. These pages show the technical parts of the vehicles. Kids will love the visual imagery of this book. Adults will enjoy the humor in the dialogue. Everything Goes: In the Air follows the same pattern of writing as the first book. This book would be great for reading before taking a trip to an airport. Not only does it cover all types of flying machines and how they work, it also covers the ins and outs of an airport. The boy has many questions about going through security and loading up baggage, and the author answers those questions with a balance of humor and information. Freight Train by Donald Crews is the perfect introduction to color words for any train lover. This story uses 6 basic colors to build a train. As the train moves down the tracks, over a tressle, through tunnels, and past buildings, the colors blur to form a rainbow train. This book introduces train vocabulary as well as color words. It is a Caledcott Honor book. Tip Tip Dig Dig by Emma Garcia is a great transportation book for young preschoolers. Each page pictures a large construction vehicle. The repetitive, rhythmic text explains the job of each vehicle. In the story, the vehicles exhibit teamwork as each machine's job contributes to a new playground for children at the end of the story. Garcia has several other books that fit well with a transportation theme. This Car by Paul Collicutt is the transportation book your child is most likely to "read" independently. The book follows a repetitive text of "This car is..." Each page explores opposites. The information is basic. It covers terms like short and long. The end pages give additional information as they label each car with make, model, and year. It seems that once an author jumps into the transportation theme of writing, they just can't stop. Collicutt also has several other books on the transportation theme. Mike Mulligan and More: Four Classic Stories by Virginia Lee Burton Virginia Lee Burton wrote some of the most award winning and noteable classic children's books on transportation. Mike Mulligan and his Steam Shovel is a classic transportation theme book. This narrative text also provides information as to how transportation changed over time. Katy and the Big Snow, and Maybelle the Cable Car are other transportation themed books included in this Virginia Lee Burton anthology. Trucks Board Book Trucks by Byron Barton is a very simple text and simply illustrated first guide to types of trucks. The large picture on most pages makes this a great choice for young preschool children. The bonus is that early readers in your house will possibly be able to read aloud to younger children! This was one of my boys favorite books when they were toddlers. Again, Barton has an entire series of transportation books. 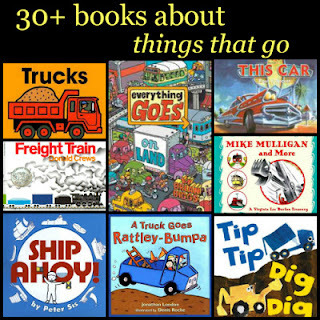 A Truck Goes Rattley-Bumpa A Truck Goes Rattley- Bumpa by Jonathan London is a great introductory book for a transportation or vehicle unit in preschool. Simple texts and clear illustrations define trucks, give uses for trucks, and engages children in the reading. Ship Ahoy! Ship Ahoy by Peter Sis If you read my Dinosaur theme list, you may remember wordless picture book author, Peter Sis. Sis once again engages the child's imagination as he tells the story of a young boy who imagines a ship all while staying on his own couch. Children will learn they don't have travel far to experience all types of vehicles and transportation. Other books in the series include Trucks: Whizz! Zoom! Rumble Airplanes Trains: Steaming! Pulling! Huffing! Cars: Rushing! Honking! Zooming! Don't Let the Pigeon Drive the Bus! (Big Book Edition) (Pigeon Series) Don't Let the Pigeon Drive the Bus by Mo Willems--- you probably know how this one goes, the bus driver leaves after asking the reader to make sure the pigeon doesn't drive the bus and the pigeon shows up the the scene begging to well, drive the bus! There are many informational texts for a transportation theme, several great narratives about vehicles, but Don't Let the Pigeon Drive the Bus is a perfect persuasive (argumentative) text to round out your transportation unit! Dig Dig Digging by Margaret Mayo Another great book on the transportation theme! I loved reading this book about vehicles to my boys when they were young preschoolers. The busy trucks and diggers work hard all day and then settle down to sleep at night. You can read a full review of Dig Dig Digging at Story Snug. Thanks to +Catherine Friess for recommending this one on G+! Whether by car or by truck on land or by sea, let your kids books take them somewhere this summer. Vehicles can be a fun theme for summer learning as well. Read books about vehicles and see how many you can spot on your travels this summer! Do you have a favorite transportation preschool theme book? Check out my Preschool Themes Book lists. There are books on topics such as me and my family, back to school, colors, shapes, animals, dinosaurs, and more! Also, find activities to accompany your preschool themes on my Preschool Themes Pinterest Board. I'd love if you'd follow while you are there. I was always searching for transport theme books for my son - great list! What an awesome list of books... my car obsessed toddler will be thrilled when we search for some of these at the library! Thank you for this list! My son loves Tip Tip Dig Dig, so I'm sure others on this list will be a hit. Our favorite was one called My Truck is Stuck!